Solution-processed n-type organic field-effect transistors (OFETs) are essential elements for developing large-area, low-cost, and all organic logic/complementary circuits. Nonetheless, the development of air-stable n-type organic semiconductors (OSCs) lags behind their p-type counterparts. The trapping of electrons at the semiconductor–dielectric interface leads to a lower performance and operational stability. 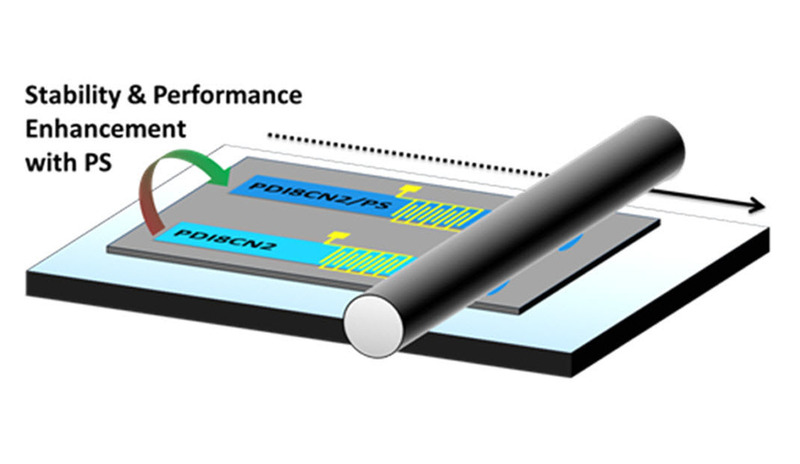 Herein, we report printed small-molecule n-type OFETs based on a blend with a binder polymer, which enhances the device stability due to the improvement of the semiconductor–dielectric interface quality and a self-encapsulation. Both combined effects prevent the fast deterioration of the OSC. Additionally, a complementary metal-oxide semiconductor-like inverter is fabricated depositing p-type and n-type OSCs simultaneously.